Background To the best of our knowledge, we are not aware of any reports focusing on results of arthroscopic debridement of triangular fibrocartilage complex (TFCC) tears in immature patients. 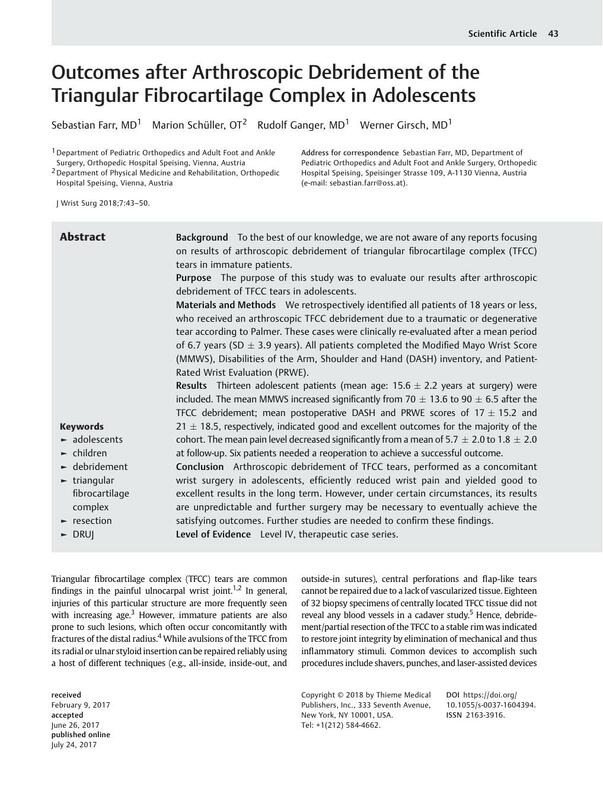 Purpose The purpose of this study was to evaluate our results after arthroscopic debridement of TFCC tears in adolescents. Materials and Methods We retrospectively identified all patients of 18 years or less, who received an arthroscopic TFCC debridement due to a traumatic or degenerative tear according to Palmer. These cases were clinically re-evaluated after a mean period of 6.7 years (SD ± 3.9 years). All patients completed the Modified Mayo Wrist Score (MMWS), Disabilities of the Arm, Shoulder and Hand (DASH) inventory, and Patient-Rated Wrist Evaluation (PRWE). Results Thirteen adolescent patients (mean age: 15.6 ± 2.2 years at surgery) were included. The mean MMWS increased significantly from 70 ± 13.6 to 90 ± 6.5 after the TFCC debridement; mean postoperative DASH and PRWE scores of 17 ± 15.2 and 21 ± 18.5, respectively, indicated good and excellent outcomes for the majority of the cohort. The mean pain level decreased significantly from a mean of 5.7 ± 2.0 to 1.8 ± 2.0 at follow-up. Six patients needed a reoperation to achieve a successful outcome. Conclusion Arthroscopic debridement of TFCC tears, performed as a concomitant wrist surgery in adolescents, efficiently reduced wrist pain and yielded good to excellent results in the long term. However, under certain circumstances, its results are unpredictable and further surgery may be necessary to eventually achieve the satisfying outcomes. Further studies are needed to confirm these findings. Level of Evidence Level IV, therapeutic case series. This work was performed at the Orthopedic Hospital Speising, Vienna, Austria.